I recently hosted a dinner for my husband's work--dinner and dessert. 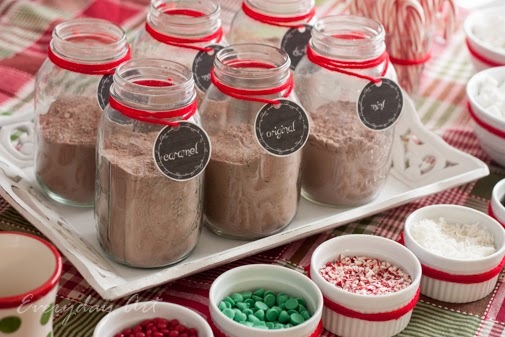 We thought that it'd be the most fun to have a cookie and hot chocolate bar for everyone. We were short on seating and it was the type of event where we thought everyone would want portable food as they mingle, so cookies and hot cocoa worked out nicely. It turned out great and was a lot of fun--yummy fun, what could be better? It was also surprisingly easy to pull off. 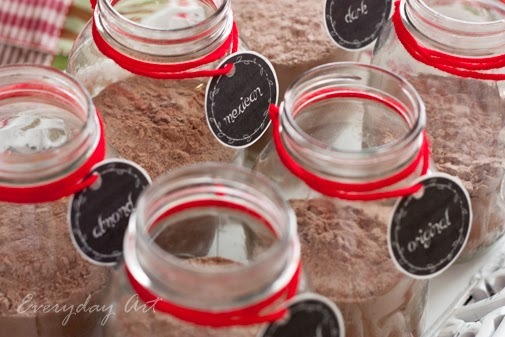 Even with making homemade mixes, the whole thing came together quickly, and my girls and I had a lot of fun testing out each of our hot cocoa flavors to make sure they were "good enough" for our guests. The of course all were. It took me awhile of scouring the web and then sampling to come up with the type of mixes I wanted. So, here is the recipe I came up with. Put all of this in your food processor and pulse until chopped and mixed well. 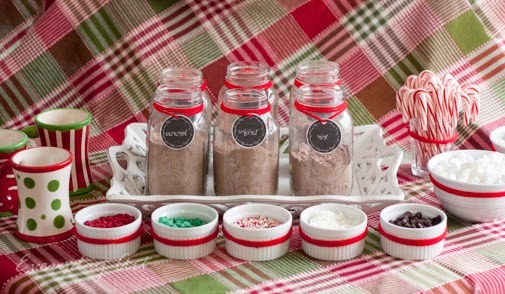 I had little jars of coconut, red hots, crushed candy canes, chocolate chips, mint chips, and of course marshmallows. In the end, it was a success. Tasted good and it was fun. I think I will do it again this weekend when family comes for our annual gingerbread house making party! And maybe neighbor gifts? so easy! Fantastic idea! Thanks for the info, might try this one day! Have a lovely Christmas!